The biting Canadian winter is not for the faint hearted. In the city of Winnipeg outdoor activities take on an added dimension: it is the coldest city of its size (600,000 residents) outside Siberia. Temperatures can reach minus 30 and 40 Celsius, and winds that can make minus 30 feel like minus 50. With winter lasting up to six months, “learning to celebrate winter – learning to take advantage of the opportunities that winter provides – makes sense.” say Patkau Architects. 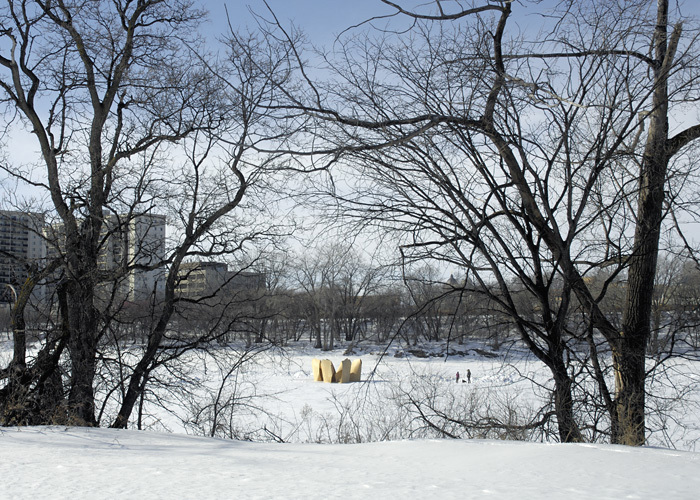 The Red and the Assiniboine Rivers meet in the centre of the city, and in winter, skating trails many miles long are created. Creating shelters from the wind along these trails enhances the ability to use the river skating trails and creates opportunities for socialisation. With this purpose, an annual program has been developed to sponsor the design and construction of temporary shelters located along the skating trails. Patkau Architect’s proposal consists of a cluster of six intimate shelters, each accommodating only a few people at a time. 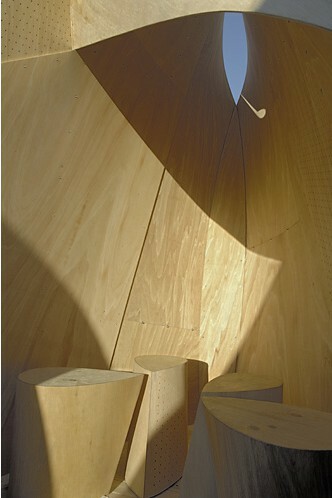 These delicate ply structures are grouped in what the architects refer to as “a small village or flock”. They stand with their backs to the wind, huddled together shielding each other from the elements. Their shape and cluster arrangement make me think of the Musgun dwellings of Cameroon which I featured a couple of weeks back. 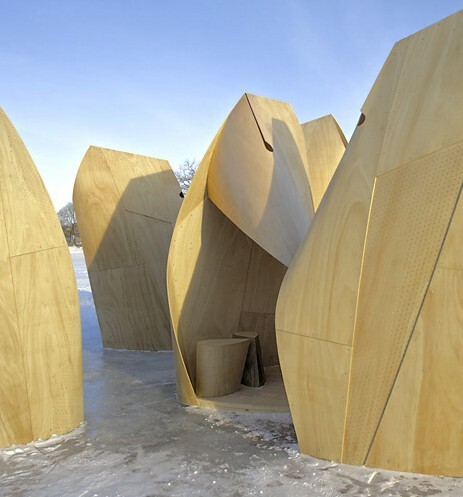 Each shelter is formed of thin, flexible plywood which is given both structure and spatial character through bending and deformation. The skins are made of 2 layers of 5mm thick flexible plywood, cut in patterns and fixed to a timber armature which consists of a triangular base and wedge shaped spine and ridge members. The architects experimented with a full-scale prototype in their workshop, in order to map the stresses of bending. Stress points were relieved by a series of cuts and openings. The form of the shelter is a resultant of this process. Grouping the shelters into a cluster begins with the relationship of two, and their juxtaposition to qualify the size and accessibility of their entrance openings. This apparently casual pairing is actually achieved by a precise 120 degree rotation. 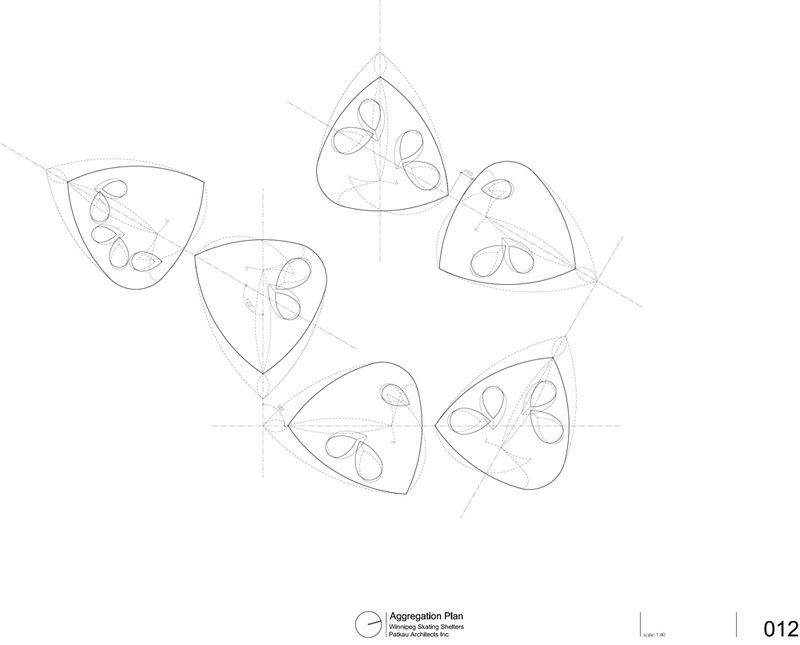 Three pairs are then placed in relation to one another through a secondary rotation of 90 degrees to form the cluster and define an intermediate interior space within the larger grouping. Together, the shelters create dynamic solar/wind relationships that shift according to specific orientation, time of day and environmental circumstance. These are delicate and alive structures. They move gently in the wind, creaking and swaying, floating precariously on the surface of the frozen river, shaking off any snow that might adhere to their surfaces. Their fragile nature heightens the awareness of those sheltered by them, of the inevitability, ferocity and beauty of winter on the Canadian prairies.